Tables are the perfect way to display information on a website in a structured, user-friendly way. With so many different types of WordPress table plugins to choose from, it’s hard to know which one to use. This is the ultimate guide to WordPress table plugins. You’ll discover the different ways in which tables can benefit your website, and the types of plugins available to meet those needs. This guide will also provide advice on choosing a suitable plugin, with an interactive quiz to recommend one that fits your needs. Finally, you will be introduced to ten of the best WordPress table plugins, with easy setup instructions to get you started. Once you’ve finished reading, you’ll know which table plugin you should use for your website, and how to get started and set it up. Tables offer a useful layout for data that is too complex to display as a list. You can use tables to create a staff directory or member directory. A table can be used to make any type of WordPress directory, such as a product directory, a staff directory, or a business listings database. 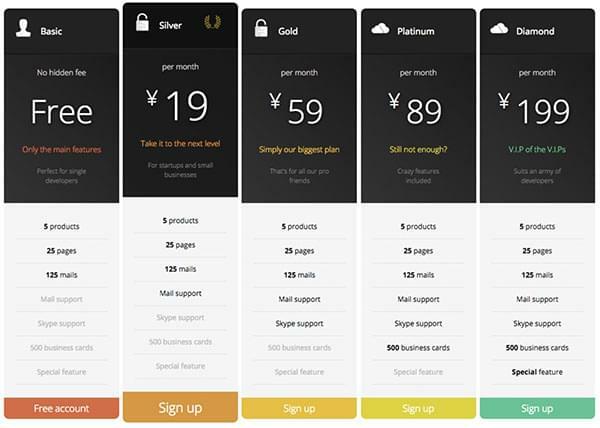 Pricing tables are an eye-catching way to visually present packages and prices. Some WordPress table plugins also create grid-style layouts for popular plugins such as WooCommerce, Easy Digital Downloads, and The Events Calendar. This can be easier for developers than being forced to create custom templates. Many WordPress developers code their own tables using HTML. However, this is not usually recommended because you can save time and create more sophisticated tables using a WordPress table plugin. HTML tables are also a nightmare for clients to edit themselves (and when the clients have to edit your code, you have an ever-increasing need for a proper backup solution)! The best table plugins are mobile-friendly and pre-styled, so you can easily create fantastic tables for any purpose. There are, in general, 3 types of WordPress table plugins: static table plugins, dynamic table plugins and pricing table plugins. This is the most common type of table plugin. They display static data in a structured tabular format with multiple rows and columns. Depending on the plugin, the table may be interactive, with responsive design, search, sort, and filters. These would still be described as ‘static’ because the data is added directly to the table and not used (or drawn from) elsewhere on your website. This is a new generation of table plugins which started emerging, for the most part, in the last year. Instead of displaying static data, these plugins automatically generate instant tables containing content that already exists elsewhere on your site. For example, a dynamic WordPress table plugin might create a table listing all the posts from a blog. It might create a product table listing all of your pre-existing WooCommerce products (or other e-commerce plugin). Dynamic tables are also a great tool for creating a WordPress document library. You might wish to create an instant table listing all of your pages, which you could use as a table of contents for your website. Or perhaps you might wish to automatically generate a list of upcoming events, or a directory of staff or local businesses. The difference between static and dynamic tables is that with the former, the data is only stored in one place. With dynamic tables, the data already exists elsewhere. This means that you can use the table to summarise information, and visitors can click on an item in the table to learn more. For example, they might want to click through to read the full text of a blog article or buy a product on another page. This wouldn’t be as easily possible with a static table plugin. 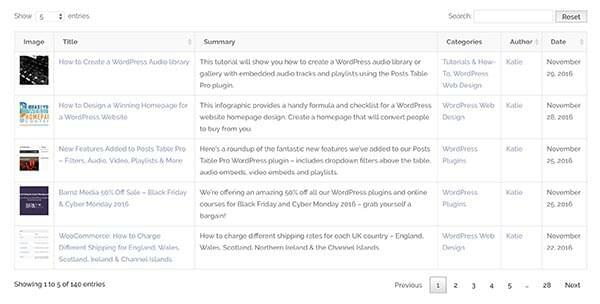 Pricing tables are the third category of WordPress table plugin. While these also display static data, they’re different to the first category because they have a specific purpose. They’re solely designed to showcase the pricing for a product or service. TablePress is by far the leading static WordPress table plugin. It has been around for years and the free version is used on over half a million websites. With TablePress, you can add data to your tables manually or import from CSV/Excel. The free version is really good, and has most of the features you’re likely to need. The notable exception is responsiveness, which is a paid extension. This is a fairly large shortcoming, as most new sites are created to be responsive, so it’s worth considering. Paid extensions are also available for extra functionality (such as filter options). In the WordPress admin, go to Plugins > Add New and install and activate the free “TablePress” plugin. Install any paid extensions if needed. Create a table via the TablePress section of the admin and insert it into a page or post using shortcode: [table id=]. Use the documentation for detailed instructions. wpDataTables is a well-established WordPress table plugin with over 9,000 users. It works in a similar manner to TablePress, but you pay a one-off fee for all the features, instead of buying each add-on individually. This can work out to be cheaper, or to be more expensive, depending on your requirements. The plugin has some neat features such as a front end table editor, which can save you time. Buy the plugin and install and activate the plugin via Plugins > Add New in WordPress. Go to the wpDataTables section and follow the onscreen instructions to create tables in WordPress. Use the documentation to make more advanced tables. Data Tables Generator by Supsystic is a free WordPress table plugin with over 20,000 users. It has all the features that you get from the premium table plugins, plus several styling options to create professional-looking tables. For a free table plugin, it’s very impressive. In the WordPress admin, go to Plugins > Add New and install and activate the free “Data Tables Generator” plugin. To to the Data Tables Generator section and click to add a new table. There are full instructions on the plugin page. Ultimate Tables is a free WordPress table plugin with a good reputation. It’s one of the best free WordPress table plugins, so try it out if you’re not willing to invest in one of the premium plugins. It’s worth trying Ultimate Tables and Data Table Generators to see which you prefer. Go to Plugins > Add New in the WordPress admin and install and activate the free “Ultimate Tables” plugin. Go to Settings > Ultimate Tables > Create New Table. Follow the onscreen instructions to create WordPress tables. Copy the shortcode to add the table to any page. 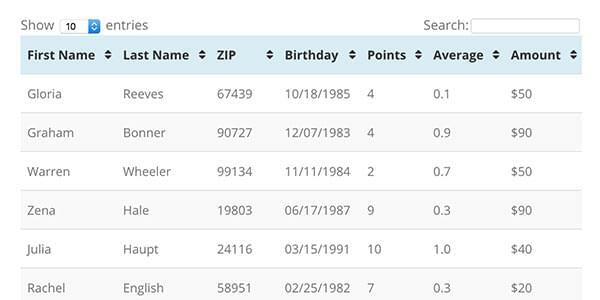 This free WordPress table plugin generates instant tables listing your WordPress posts. It has various options to choose your table columns, rows per page, and other details. The tables are responsive, searchable and sortable. This is a good quality plugin that works nicely and is ideal for creating an index of blog posts or news articles. Whatever you’re using normal WordPress posts for, this plugin can list them in a table. Go to Plugins > Add New and install and activate the free “Posts Table with Search + Sort” plugin. Enter the plugin shortcode [posts_data_table] to create a WordPress table listing all your posts. Use the documentation to to configure the table. Posts Table Pro is the most widespread dynamic WordPress table plugin available today. It lets you list any type of content stored on a WordPress website in a searchable and sortable table with filters. Unlike its free cousin Posts Table with Search + Sort, Posts Table Pro supports extra content types such as pages, custom post types, custom fields and custom taxonomies. This is where the plugin really stands out, as it opens the door to a huge variety of use cases. For example, you can generate tables listing portfolios, lists of events, document libraries or e-commerce products, and any other application you can think of. The plugin supports shortcodes, so you can create tables containing shortcode content from your theme or other plugins such as audio galleries, video libraries, image galleries, buttons and icons. There are dozens of options to customize the table. You can choose which columns to include in the table, add filters, and more. Buy the plugin and install it via Plugins > Add New. Go to Settings > Posts Table Pro and enter your license key. Enter the plugin shortcode [posts_table] to create a WordPress table listing your posts. Use the plugin documentation to configure the table. 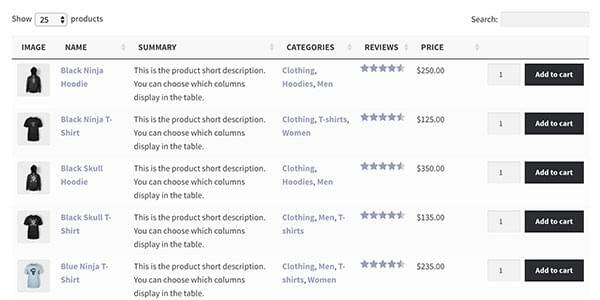 WooCommerce Product Table is a WooCommerce-specific version of Posts Table Pro. It creates an instant grid view of WooCommerce products. The product tables are searchable and sortable and you can add filters above the table to help customers to find your products. The plugin supports all the main WooCommerce functionality such as add-to-cart buttons, reviews, product images, attributes and variations. It’s popular for WooCommerce one-page order forms, restaurant ordering systems and large product catalogues. Buy the plugin and install it in Plugins > Add New. Go to WooCommerce > Settings > Products > Product Tables and enter your license key. Add the shortcode [product_table] to any page or post to list products in a table. 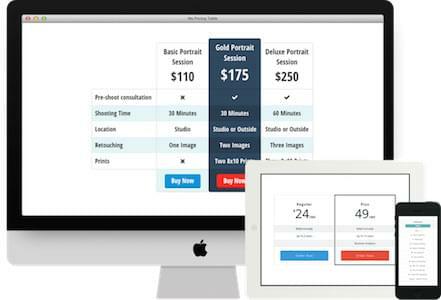 GoPricing is a fantastic pricing table plugin as it’s easy to use and comes with a huge range of designs. It has features that you don’t find in most WordPress pricing table plugins such as the ability to embed audio, video, images, icons and maps. The pricing tables are fully responsive and you can add PayPal buttons so that people can sign up and pay directly via your website. Click Go Pricing in the WordPress admin and start creating pricing tables. Use the articles and video tutorials for detailed instructions. Easy Pricing Tables is another WordPress plugin for creating impressive looking responsive pricing tables. It has a good choice of designs and while they’re not quite as stylish as GoPricing, it has some neat options such as circular pricing tables. I’d suggest looking at the demos for both plugins and choosing the one with the styles you like best. The free version is pretty good and you get extra features if you go Pro. Go to Pricing Tables > Settings and enter your license key. Create price tables in the Pricing Tables section. The Documentation contains full instructions. With over 20,000 users, Responsive Pricing Table is a popular and well supported WordPress plugin. The free version is very good and has most of the features you’re likely to need. The main thing missing is a choice of designs/skins, which you need the Pro version for. Look at the designs and choosing the pricing table with the styles that will look best with your theme. Install the free ‘Responsive Pricing Table’ plugin in Plugins > Add New. Go to the Pricing Tables section to create pricing tables. There are full instructions in the documentation. Which WordPress Table Plugin is Best? Static table plugins – TablePress is the best table plugin in this group. It’s hugely popular, well supported and very flexible. Dynamic table plugins – Posts Table Pro is the best WordPress table plugin for displaying other types of content. It’s incredibly flexible and can be used in a huge variety of ways. 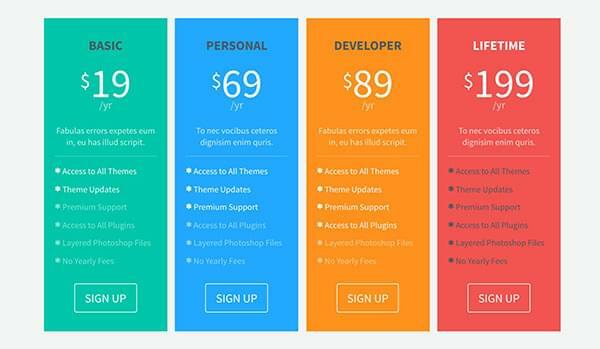 Pricing table plugins – GoPricing is my favorite WordPress pricing table plugin. It’s well supported, has all the options you need and comes with plenty of eye-catching designs. Still not certain which plugin you need to present your data? Answer the questions in this quiz for instant recommendations on the best WordPress table plugin for your website. Are there any other WordPress table plugins you recommend? Please add your comments below.